This entry is about two streets in South Buffalo: Indian Church Road and Indian Orchard Place. The streets are located on the border between Buffalo and West Seneca in the southeastern part of the City. 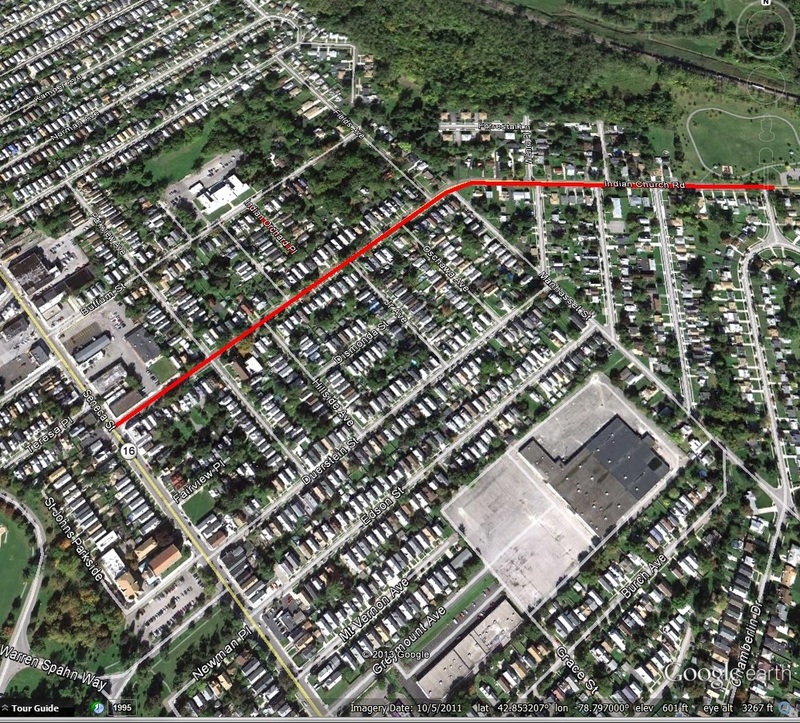 Indian Church Road runs from Seneca Street into West Seneca towards Mineral Springs Road. Indian Orchard Place is a small street off of Buffam Avenue, near Seneca Street and Indian Church Road. This part of Buffalo was the location of an Indian Village. They hunted game around the salt licks near the Mineral Springs, worshiped in the Indian Church near Seneca Street and picked apples, cherries and plums in the Indian Orchard. As early as 1600, a tribe of Indians known as the Kahquahs hunted bear and deer in the forests and built their bark houses on the banks of Buffalo Creek. The Kahquahs were the only Indian tribe living in Erie County during the time when the French controlled the trade in the region. But the Kahquahs were conquered by the Iroquois (the Haudenosaunee…or people of the Long House) and the Seneca moved in following the Revolutionary War. The Seneca established a village in roughly the same location, the village was centered around the council house. Around 1804, missionaries came to live with the Indians, shortly after the Village of Buffalo was established. they built a school where they taught the English language, agriculture, reading and writing; they also taught the women how to knit and sew. A church was established in 1823 and by 1828, there were so many converts, they needed a place to worship. 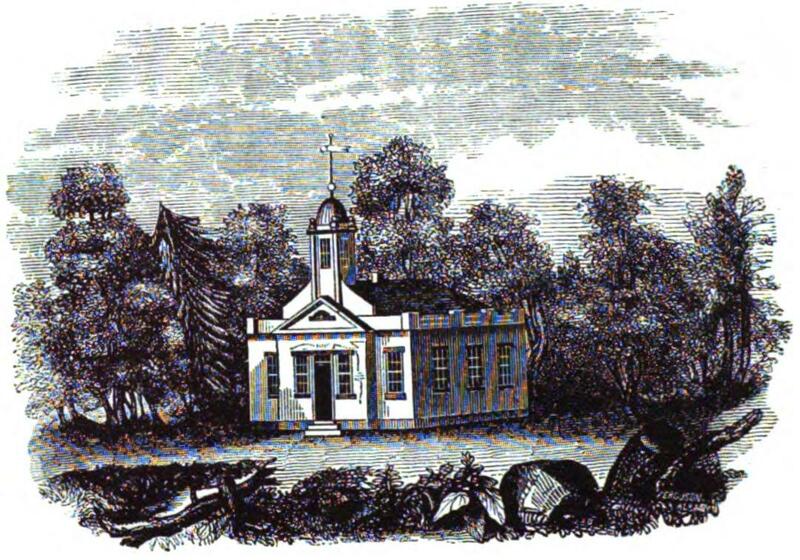 The Seneca built a church, and in 1829, the church was dedicated. The church stood about 400 feet from Seneca Street and was known as the Seneca Mission Church. The church was located approximately in what now would be the middle of Indian Church Road. 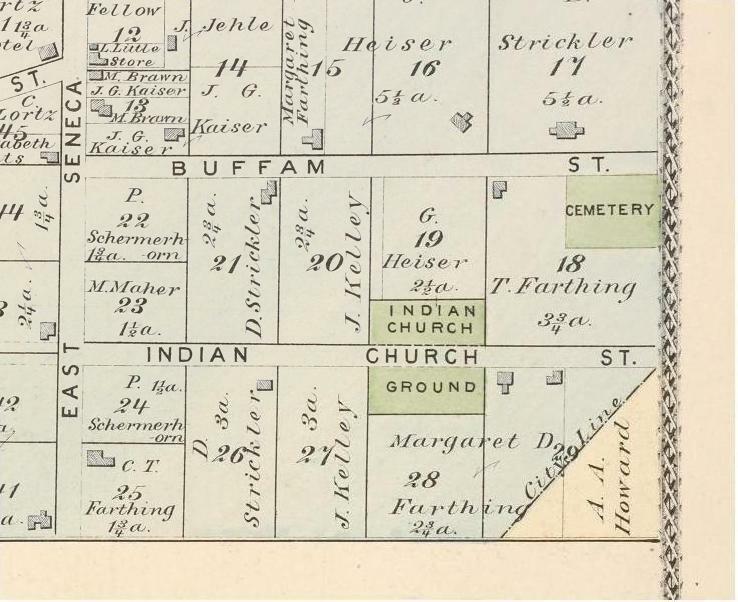 1880 Erie County Atlas depicting Seneca Indian Church Ground and Cemetery location. 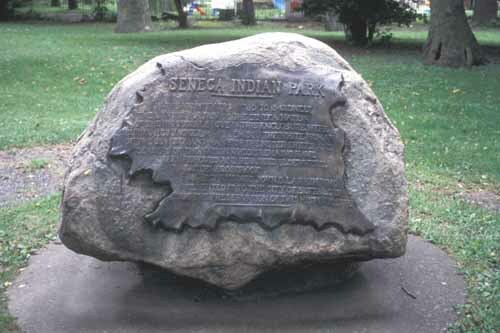 An Indian burial ground was located in the present location of Seneca Indian Park, at the corner of Buffum Street and Fields Avenue. This burial ground was where Red Jacket and Mary Jemison were buried. The bodies of those interred in the cemetery were moved to Forest Lawn (Mary Jemison was moved to Letchworth). The Buffalo Historical Society oversaw the removal and reburial of the remains of the Seneca. They raised funds to build the Red Jacket Statue in Forest Lawn, erect headstones, pay all expenses for the Indian delegates and for ceremonies held October 9, 1884 to inter the remains. After the Seneca moved from the Buffalo Creek Reservation in 1842, the church fell into disrepair. The church was abandoned and was blown down during a storm. The only part of the church which remains today is the arrow from the weathervane from the top of the cupola. It is currently in the collection of the Buffalo and Erie County Historical Society. The mission house was replaced by School 70, Indian Park Academy. The burial ground was later purchased in 1909 by John Larkin of Larkin Soap Company, Mr. Larkin then donated the land to the City of Buffalo for a public park, which was dedicated in 1912. John’s wife had taught at the Seneca Mission House in her youth. Despite living on the Cattaraugus Reservation, many Seneca returned frequently to the sacred burying grounds, camping at the foot of Buffum Street. As time passed, these pilgrimages became less frequent. H. Perry Smith. History of Buffalo and Erie County. D. Mason & Co, Publishers: Syracuse NY 1884. McCausland, Walter. “Landmark of Indian Days to Pass from Scene”. Buffalo Courier-Express, October 13, 1940. Severance, Frank. “Seneca Mission at Buffalo Creek”. Publications of the Buffalo Historical Society, Volume 6. Buffalo Historical Society Publications. 1903. Great work! I made a video about this same topic this past summer. Here is the link: http://vimeo.com/71483892 I grew up on Indian Orchard Place. Briefly opened the video, will return when the full 32 minutes is available to review. Interesting subject. Very informative and interesting. Thank you for your efforts and time devoted to the Discovering Streets of Buffalo series. Interesting,but why perpetuate the misuse of the term “Indian”;it should be “Native Americans” please! Thank you – I really enjoy your work on this blog and your research! Though you probably want to keep everything on the positive side, I have added the above link about the Buffalo Sewer Authority digging up the Mission Church Cemetery grounds in 2009. Despite public appeal to Mayor Brown and others, the Authority dug up gravesites to install a sewer line, leaving bones of those buried scattered on the ground. Mary Jameson settled here on the Buffalo Creek Reservation in 1831 and died here on Sept 9, 1833 at 91 years old. She was initially buried at this Cemetery until her remains were exhumed on March 7th, 1874 and moved to a location in what is now Letchworth State Park (they were moved at that time so that Indian Church Road could be built). Jameson, also known as the “White Woman of the Genesee”, purchased 17,927 acres of land (surveyed by Augustus Porter in 1798) near the Genesee River and operated it as a retreat/asylum dedicated to the destitute. Her life is an inspirational symbol of both white and Native American settlers in our area and the early years of Buffalo – as are the other people whose gravesites were blatantly desecrated. Mary Jameson’s remains were ensured a respectful transfer to Letchworth by her grandson…unfortunately, most of the Native Americans buried here did not receive the respect which their culture values so much. This is a very interesting article. For 13 years we owned a home on Silverdale which was a small street next to School 70. We were aware of the cemetery but had no idea that Mr Larkin purchased the land to turn it into a park as it is today. Another thing I noticed is the changing of the spelling of Buffam to Buffum. Thank you for taking the time to publish this article. It’s always fun to see what things were like in the past. It’s an ever changing world where someday we’ll be part of that history also.